Harvard's brand-new union is delving into state politics by pushing for a bill designed to help spread awareness about issues of sexual assault on college campuses. Harvard’s brand-new graduate student union is wading into state politics to advocate for a sexual assault prevention law currently under consideration by the Massachusetts state legislature. In late July, the union’s Time’s Up Committee — a sexual harassment-focused advocacy group — organized a phone bank to make their case to legislators, who may vote on the bill either this fall or next year. The union committee, established by Harvard Graduate Students-United Automobile Workers in May 2018, held the three-day phone bank in support of Bill H.4810, the third version of that legislation that has circulated since 2016. If Massachusetts Governor Charlie D. Baker ’79 signs it into law, the bill would mandate that Harvard and other academic institutions undertake campus-wide climate surveys on issues of sexual harassment and assault every other year. In addition to setting up phone bank stations on-campus, HGSU-UAW also distributed a script to union members off-campus. 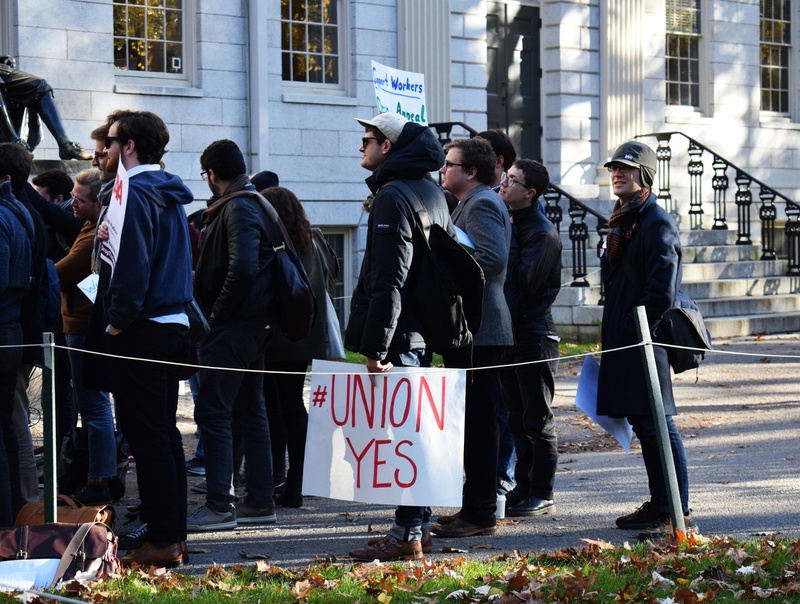 Though the phone bank is the union’s first large-scale advocacy effort since the University recognized HGSU-UAW after a precedent-setting vote in May, union members previously delved into political activism in the run-up to the Nov. 2016 unionization election. After President Donald Trump's controversial travel ban affecting certain Muslim-majority countries prevented several Harvard affiliates from entering the United States in Jan. 2017, union members called for the creation of a hotline that would offer advice to students affected by the policy. Union spokesperson Ege Yumusak ’16, a Philosophy Ph.D. candidate, wrote in an email that the union’s new recognition and partnership with the United Automobile Workers has provided “a platform for international representation” that has bolstered advocacy efforts. “As organizers within this larger framework, we participate in the fight to end sexual violence in any way we can using the representative power of unions in addition to our collective bargaining power here at Harvard,” Yumusak wrote. The Facebook event announcing the phone bank noted that Harvard last conducted a campus-wide climate survey in 2015. That survey found that 31 percent of senior undergraduate women at the College had experienced some form of sexual assault at Harvard, prompting then-University President Drew G. Faust to dub the survey results “deeply disturbing” in an email to students, faculty, and other Harvard affiliates. Harvard has since implemented a number of the group’s proposals. But it has yet to conduct another climate survey. John B. Gabrieli ’16, who worked with State Rep. Lori A. Erlich to develop the bill, said the legislation was originally meant to address concerns that public data about sexual assault on college campuses is inaccurate due to underreporting. The organization Gabrieli co-founded, Every Voice Coalition, has been advocating for campus climate survey legislation in various forms for four years. “Almost all the students that we talked to themselves knew friends, family members, and people on their college campuses had been affected and felt that the public data was dramatically underreported and silencing their experience, or misrepresenting it,” he added. While Harvard does not release information about the outcomes of individual sexual assault cases, the University’s central Title IX Office and Office for Dispute Resolution do publish reports that aggregate anonymized statistics about sexual assault each year. Harvard saw an uptick in reported instances of sexual harassment during the 2016-2017 academic year, according to the most recent published data. In addition to mandating that Harvard and other academic institutions conduct regular surveys, the bill also requires that survey data be made public. In a July press release, Erlich said publicizing results more frequently will allow lawmakers and students to better assess the frequency of sexual harassment at colleges and universities around the state. The campus climate bill has garnered support from other Harvard student organizations in addition to the union. In April, eight Harvard groups — including the Harvard College Democrats, the Harvard Republican Club, and anti-sexual assault advocacy group Our Harvard Can Do Better — endorsed a rally for an earlier version of the bill. Representatives from MIT, Boston University, and other area colleges also attended that demonstration in Boston. Though distinct versions of the resolution passed both the state House and Senate, both bodies must reconcile the differences and approve the bill’s final form before they send it to the governor’s desk. Gabrieli said that, if the legislature does not pass the bill this fall, Every Voice Coalition will work to reintroduce it in the 2019 legislative session.